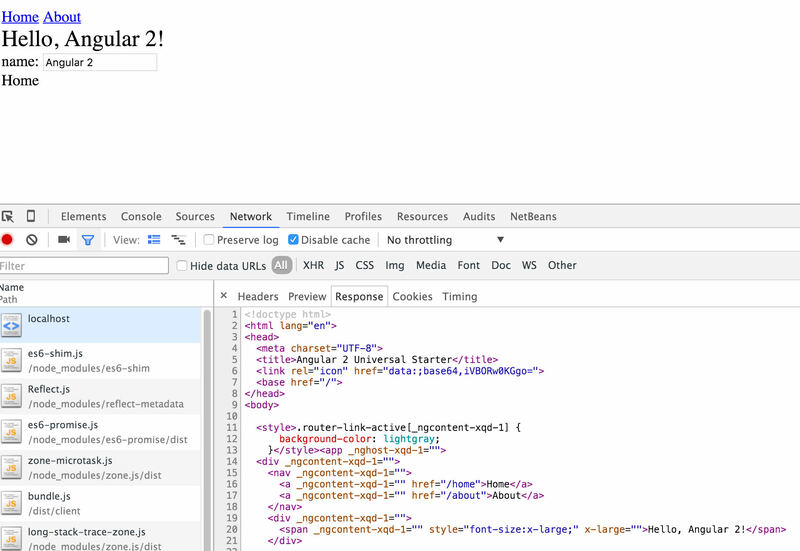 Angular 2 Coming to Java and Python: The First Multi-language Full Stack Platform? Although nothing is concrete yet and we don't have much details, it's probable that Angular will be ported to other languages together with its server-side side counterpart Angular Universal. By the looks of it, it's very well possible that Angular could in time become the first multi-language full stack development platform. With Angular 2, we’re really attacking it from a 'platform of capabilities' standpoint... Our plan is to have versions that will work with many server-side technologies, from Java to Python. Angular 2 itself is available in Dart, and it's internally built in Typescript. But the possibility of making it available in other languages and platforms other than Dart is something else completely. Angular Universal is a core Angular project for enabling the use of Angular 2 on a Node.js server for the purposes of server side rendering. Notice that in the first part of the AngularConnect talk we can see an example of how to use the Angular 2 dependency injection on the server. It's worth mentioning that this could be done also without Angular Universal, as a way to structure a server app into decoupled modules. Notice that a server side location provider is passed to the application. The way that the Angular 2 router works on the server is that if the user gets sent a direct link to some route inside the application, for example http://yourdomain.com/someroute, the server side version of the router will then take the route path /someroute and use it to determine which component should be rendered. Server side rendering has become popular for example in the React community, as it allows product organizations to build single page applications that do not suffer from search engine indexability issues, and give the user a much-enhanced user experience. Let's now see all this works together in practice, and then how all this links back to the announcement of Java and Python versions. We can see that the server parsed the component tree and sent back the HTML with only a relatively small script at the bottom of the page containing the registrations of the application browser event handlers. We can also see that the HTML that came was produced in a node server, but that could have been produced by any other server technology: Java, Python, etc. It's not only about solving SEO issues for single page apps, using Angular on the server allows an enhanced user experience and provides the same app the ability to work across a wider range of devices. Although nothing is concrete yet and we don't have much details, it's probable that Angular will be ported to other languages together with its server-side side counterpart Angular Universal. By the looks of it, it's very well possible that Angular could in time become the first multi-language full stack development platform.